Latest release (Oct 2014) is Graz 1975, and this is previewed on the site. Due in March – well this week in fact – is the reissue of STOCKHOLM 1970. This first came out on Connoisseur as a 2CD set, and was then remastered for the Sonic Zoom series (and also issued in USA and Japan). The latest edition has added some extras to generate interest; including what the label claim is the first ever release on DVD of the Granada TV Doing Their Thing performance (which actually came out as a stand along DVD some years ago), and two audio tracks from Paris 1970, audio source not given. 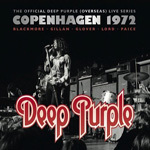 COPENHAGEN 1972 – is due out in April 2013, the fourth reissue of this title in Europe. To gee it up they’ve added bonus material… three tracks off the 1973 ABC In Concert. PARIS 1975 – released December 2012. This is a 2CD set as per the original release. They have mastered it from the original CD (or rather “remastered and sonically scrubbed”) and added some later interview clips as bonus material. The cover is a great shot of Ritchie by Fin Costello but clearly chosen for maximum sales impact rather than any historical accuracy, as it’s from the band’s 1974 tour and I’m not sure your average punter in the street will understand the Official DP(O) Series tag line but if you didn’t get the original or want the new edition for completion it’s in stock at DTBOnline store now. SERIES ANNOUNCEMENT • DPO have announced a repositioning of all the existing archive titles on Purple and Sonic Zoom. These will now reappear on the Edel label in Germany and be much promoted by the looks of things (the original releases were all kept fairly low-key as a condition of the license). The series starts shortly with a reissue of the Paris 1975 2CD set in new packaging, with a bonus interview. Here is their publicity shot for the series which they plan to complete over the next two years. We’ll cover the new editions here as they appear. FAQ answer: Simon is not involved in this project. In 2012 Edel cockily promised “Over the next 12 months there will be 10 NEW RELEASES as part of the Deep Purple Overseas Live series” – are they already pumped out or why are there only five (new?) re-releases after nearly four years? If my ears work OK, then the announced “Paris Olimpia” tracks are in fact from the Pop Deux TV show. Simon? You’re supposing that I would be sent a review copy Daniel! Does anybody know, which one comes next? Mark: why would they put Steve Morse on the cover of a recording from 1975? Check your DP chronology…. When is “Made In Europe” going to get the Deluxe Treatment or the other show’s that were recorded at the end of this tour going to be released. The version of “Burn” on “Made In Europe” is the best live version ever put down on tape and would love the other concerts as well as Paris…..
+1 to John’s suggestion, although for me it’s the version of ‘You Fool No One’ from Made in Europe that I like the most of all those I’ve heard. Great entry and bass playing from Glenn, wonderful contrasting solos from Mr B. Mistreated ain’t half bad either. Poor old Saarbrucken: it must feel left out with all the attention paid to Paris and, to a lesser degree, Graz. I just tried to buy this via DTB online but it says ‘price tbc’ so I can’t place an order. Help! You can order, we just haven’t got the final price confirmed. Ann will email you to let you know before we send it out. I argee. Keeping these fantastic recording available is a dream come true. Younger fans will hear some of the finest live albums ever. I have at times wondered if, DP has some live recording in their vault. It’s time they saw the light of day. Some many others from that era have started doing it. Even if we already have them, it’s nice to have a clean and remastered version. Where have you been for the last ten years Rick?! Could they have not put Steve on the cover this time?! At this particular juncture in time it is perhaps fitting to thank someone without whose zeal most of these recordings would probably never have seen the light of day in their current form and quality: kudos to Simon Robinson. On the upside there is of course the possibility that with the transfer to Edel more vintage recordings will be released. I’m keeping my fingers crossed, but I won’t hold my breath. Thanks for that Bernard, and for all the other nice comments people have posted. For me as a fan that was all it was about, making editions I’d want to buy.